Deputy Information Minister Energy Mutodi suffered Twitter humiliation on Monday after wrongly claiming an unflattering picture of President Emmerson Mnangagwa was "Photoshopped". Exiled former Information Minister Jonathan Moyo posted the image on Twitter, showing Mnangagwa seated on a carpeted floor in a small room with what appears to be traditional pots on a table in front of him. In the room, animal hides hang from the walls. 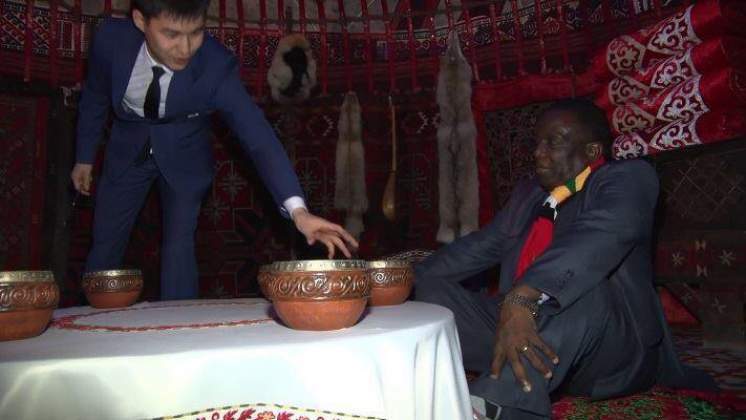 It could pass for a traditional healer's house in Zimbabwe – but this was a museum in Kazakhstan where Mnangagwa was on a state visit. Moyo posted the picture with a hashtag: "#Abracadabra!" Despite Mnangagwa's visit to the museum having made ZBC news on Sunday night, and the state-run Herald newspaper having used the same image on its website on Monday, Mutodi still thought it was fake. Professor Jonathan Moyo has tweeted a photoshopped image of President ED Mnangagwa purportedly performing a ritual. I have no doubt that only fools & rumour mongering idiots will believe that to be true. The response was fast in coming from Moyo, who told Mutodi: "Your claim is evidence that your head is heavily congested!" The reference to Mutodi's head being "congested" appeared to be a deliberate dig at the deputy minister who last week claimed that a government shutdown of the internet, since ruled illegal by the High Court, was in fact a problem of network congestion.